There's a liquor store around these parts that has wine tastings during the first Wednesday of the month. My group of friends decided to check out this event, to ascertain its merits. Some of us even dressed up for the occasion. I just changed into jeans at work and showed up ready for fun. My sister-in-law even came along, but she wouldn't let me take her picture. 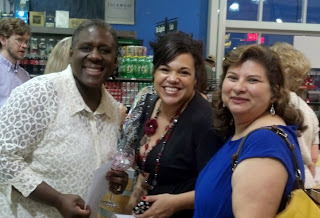 I'd never been to a wine tasting at a store, which is another sign that I need to get out more. This particular place had set up 9 barrels, offering at least two wines at each barrel. 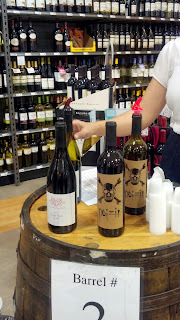 At the entrance to the store, there was a checklist showing each label and the wine offered. As you went to each barrel, the hostess would speak about the vineyard and the particular wine, offering suggestions about various foods to pair it with. Then they would pour a tiny cupful of wine and hand it to you to taste, which was to be the entire purpose of our activity. We dutifully swirled the wine around our palates like pros, and made the appropriate comments on our checklist. But I digress. Remember that scene in Finding Nemo, where all the seagulls are gathered around Nemo and Dory, waiting to eat them? That is what happens when free food or alcohol is offered in these parts. 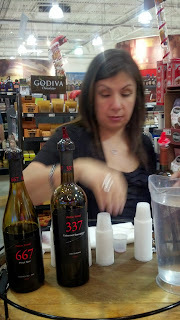 A little crowd had gathered around us before the tasting began. Some women had even brought their own wine glass! Once it was time to start sampling, my homegirls(oh yes, I went there) and I went to the last barrel to begin our tasting, instead of lining up at the first barrel like everyone else. Because we're contrary, the entire lot of us. Plus, we were smart enough to figure out that we could be first in line at the last barrel. The trend in wine these days is to slap a pithy name on the label with a clever graphic design. I wasn't as impressed by this label as much as others were, mostly because the word "poison" was spelled incorrectly. It's a sickness, this need to correct everyone else's spelling. I thought that I would have grown out of that by now, but not so much. I am getting better at not loudly pointing it out, though. I don't even carry a red pen around with me anymore. Yay me. Did I mention that there was also food? 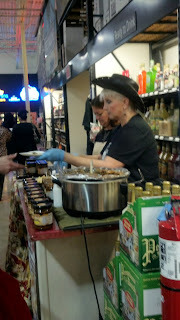 This lovely lady offered us homemade chili and peach cheesecake, along with a variety of salsas and chips. I am always happy to see small businesses reaping some benefits from these big bargain stores. There was another person with chips and salsa on the other side of the store, but the large mass of people congregated around this lovely woman told me that she was the crowd pleaser. The chili did not disappoint, and I bought two jars of her salsa to show my support. Our adventure in wine tasting lasted a little less than an hour, unfortunately. We are all speed-wine drinkers! We even managed to shop while we were in there, which was the whole point of a liquor store holding a wine tasting. We were still in the mood for fun, however, and it was barely dark. Luckily, there was a restaurant within walking distance. Away we went, for drinks and food and conversation. The conversation was the best part, although I really can't remember very much of it. I was too busy having fun, I guess. Too busy having fun, huh?? You just keep telling yourself that, girlfriend!!! !